PEL is a famous brand in Pakistan, it produces home appliances for its loyal consumers. One of its product is Air Conditioners (AC). 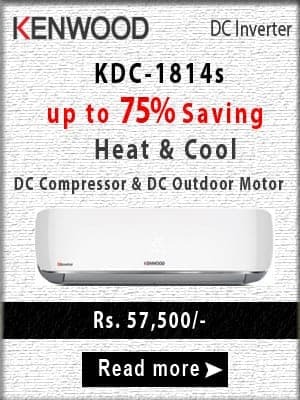 In 2018, they announced Fit series of inverter AC. The main difference between its other models of inverter series and fit series is the SEER (Seasonal Energy Efficient Ratio). Its SEER is 4.0 and fit series PEL AC models InverterOn are High-End Inverter models. This PEL 1.5 Ton AC PINVO 18K Fit model series is capable of heating and cooling with a technology of A+++. It has a bigger indoor unit with a sleek design and longer air throw. PEL AC 1.5 Ton Fit can start as low as 140 volts. In this way, these Air Conditioners doesn’t need the stabilizer. It saves electricity by up to 60%. PEL AC power consumption is (550-1500 Watt) Approx. Some of its features are Sleek and stylish design, Ultra Low Noise Control, Hyper cooling – 30 Seconds, Gold/Blue Fins, Hidden Display, Auto Restart, Auto sleep and Both in and out wings can move with a remote control. At the display, error codes are available for the specific problem. This home appliance is available in White color. Disclaimer: We tried our best but we cannot guarantee that the Specs/Price on this page is 100% correct (Human error is possible). For correct info. & buying always visit the nearest local shop. You can buy this product online in Pakistan and also from local shops in different cities in Pakistan. You can also avail the options of Cash on Delivery (COD) of this product from different online stores. The latest price of PINVO-18K was updated from online stores and local shops. What is the price of PEL Fit 1.5 ton pinvo today?